NATO Boeing E-3 Sentry in flight. 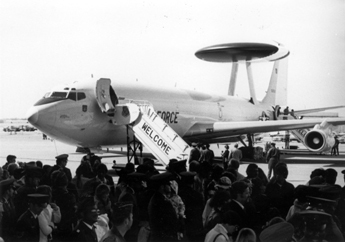 The Boeing E-3 Sentry is a military aircraft. 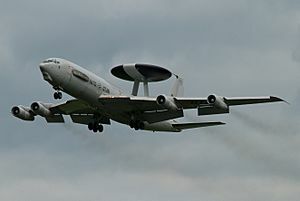 It is used as AWACS by US Air Force, NATO and three foreign operators: France, Saudi Arabia, and the UK. It is a military variant of the famous Boeing 707's airliner. 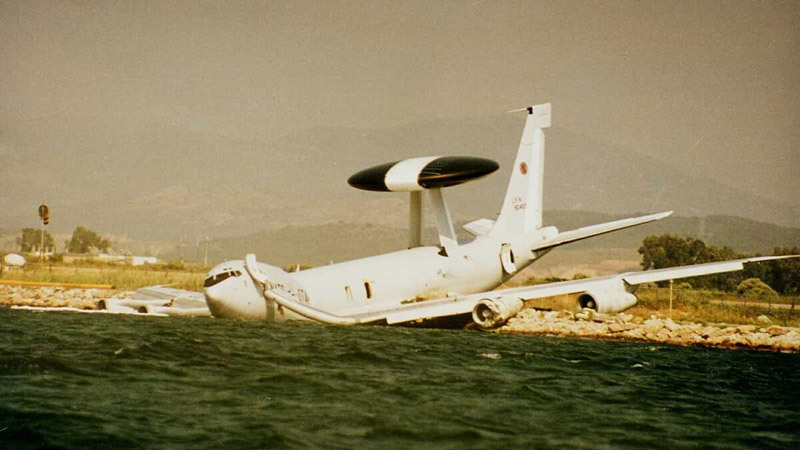 This kind of aircraft was used in the Gulf War, and after in the Afghanistan War. Close-up view of the radar, which revolves at 6 revolutions per minute. NATO E-3s have the registration LX on the tail. The chin bulges house a suite of electronic warfare support measures. Boeing E-3 Sentry Facts for Kids. Kiddle Encyclopedia.